Identify more shoppers using sophisticated ESP integration. Read more. Use bigger and better data to drive custom triggers based on behavioral and transactional data. Build robust real-time recovery programs in email and web. Learn more about Fresh Relevance cart and browse abandonment solutions. Support for standard OpenCart sites within a few days (we do all the work), and complicated sites by agreement. Fresh Relevance sends real-time, cart abandonment and browse abandonment emails to the customers of your OpenCart store. The emails are personalized, including product pictures and links back to your store, making it simple for lapsed customers to return and buy. 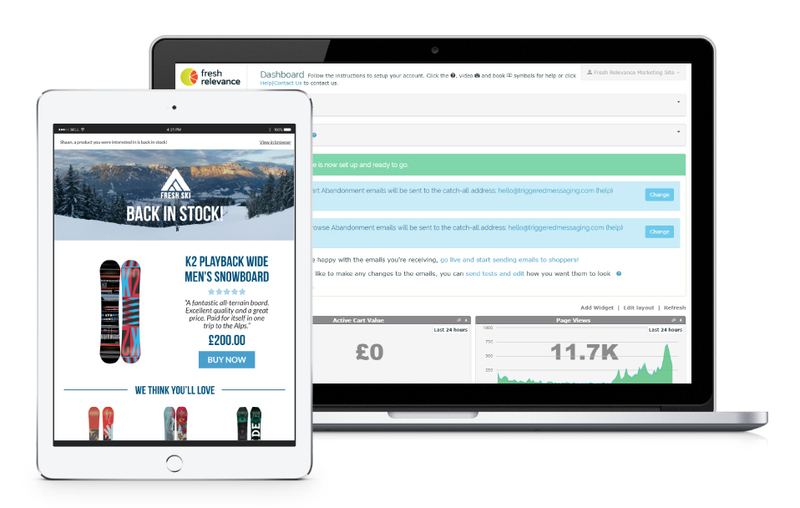 Real-Time Product Recommendations on your Website and in your emails. Established in 2013 and based in Southampton, UK, Fresh Relevance is the real-time engagement marketing hub that drives sales for online retail and travel brands with real-time, hyper-personalised website and email content. Fresh Relevance has more than 200 clients, including: Cottages4U, illy, Kuoni, Moss Bros, Thorntons, White Stuff and 7dayshop. And we're The Most Recommended Cart Abandonment Solution, by Members of OnlyInfluencers.